Welcome to my Sinistar homepage. 12/24/2011 - Warren noticed that my Duramold Sinistar, his, and Matt Sz's. were all manufactured on the same date. It seems highly coincidental that all three of the known Duramold Sinistars were made on the same day. That seems to suggest that the production run was very small. 12/24/2011 - Have seen this eBay auction recently for a rare Atari 5200 Sinistar catridge. 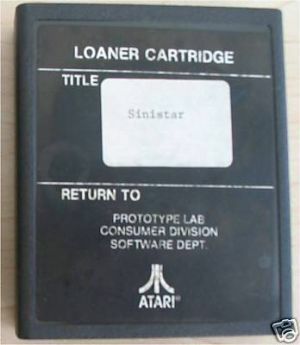 I hadn't heard of Sinistar for the Atari 5200, so I did a little searching. Turns out Wrathchild at AtariAge ported the Atari 2600 version over to the 5200 platform. They used the artwork that was designed for the original Atari 2600 version of Sinistar. I must say they did a really nice job on building these cartridges. Albert at AtariAge sold a limited edition run of cartridges in 2010. They were priced at $25 plus $3 shipping. 1/19/2011 - Was researching the Sinistar's cameo in Star Rider, and found it in level 4. Link to YouTube video. At 0:26, you will see him fly across the left side of the screen. 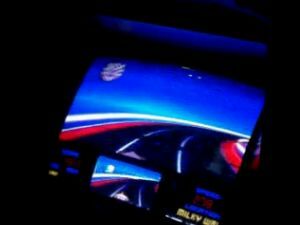 The video is a bit fuzzy, but it is definitely Sinistar. Another interesting thing are the crash explosions.  When the Star Rider crashes, it is similar to the explosion when Sinistar destroys the ship. Concidence? Maybe, but there was likely some Sinistar team members working on this game as well. Update: I checked the Star Rider Videodisc, and Sinistar is not recorded on the disc. It must be represented in software. I also read that Joust makes a cameo in the game as well. The MAME team has the CHD of Star Rider. They don't have the game emulated yet. 1/17/2011 - Received an email and photos of possibly the worst abomination. 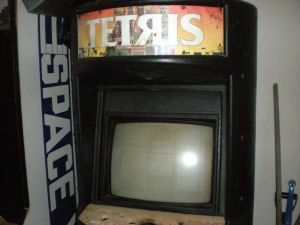 Yes, a Duramold Sinistar converted into a Tetris. Well, Tetris is a fun game, so it could have been worse. You can see that it has the single speaker hole above the monitor, which means it was a Sinistar and not a Blaster cabinet. The owner also had the Duramold Sinistar marquee as further proof. 9/12/2010 - Got Sinistar working on the Wii. You have to have Homebrew installed, then install SDL MAME Wii by Toad King. The current version 0.5 of SDL MAME Wii doesn't run Sinistar, but a patch is in the source code repository. If you compile from the source, it works quite well. For those who are faint of heart with compiling the source code, you might be able to bribe Toad King to release the patched version (I've heard that programmers like pizza and beer). You use the Wii nunchuck for steering the ship, and fire with button 1, and sinibomb with button 2. There is no sense in putting up a screenshot since it is the same as any other MAME version. Update 1/17/2011: It looks like version 0.6 is available on homebrew with Sinistar working. 11/14/2008 - RARE! Atari Prototype loaner cartridge is up for sale on eBay (LINK). On day two of the auction, it is already up to $158.25. The seller indicates that only two or three of these might exist. 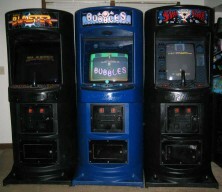 I saw a picture of a different Atari Sinistar prototype, so it appears at least two exist. Some people have been burning the prototype roms and putting them in old cartridge cases, but this appears to be an original, and I am guessing that it is as rare as the seller states. I could see this going for between $500 - $800. I would love to buy it, but it is already moving out of my price range. Update: it is up to $224.50 as of 11/17. Two days left! I am revising my guess, and say it will go for closer to $400-$500. Update (11/20): It sold for $301.50. A bit lower than I expected, but still a heck of a lot for an old piece of video grame history. 11/10/2008 - Got more information from Jonathan that the top half of the head pictures in the background images below are not the only Sinistar in the game. He said that there is actually a full Sinistar that flys across the screen on the third level or so. Star Rider has never been emulated. 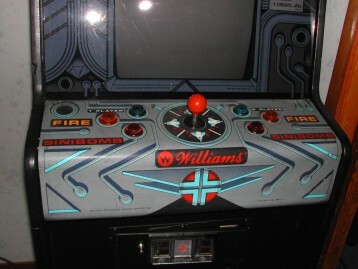 Jeff Vavasour, who ported Sinistar for the William's Arcade Greatest Hits, said that he would someday like to port Star Rider. I looked around, and it looks like the only way to play it would be to find someone that owns an original. This is a somewhat rare game. There are only 14 owners on VAPS. Sinistar has 102 owners on VAPS. 10/13/2008 - Received an email from Jonathan in the UK. 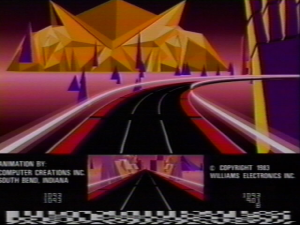 He remembered seeing Sinistar in the Star Rider LaserDisk game. I did some investigation, and found some screenshots. Full size images are here. 6/20/2008 - Someone sold a New-in-the-box Sinsitar. They were asking $2495. My friend, Warren, had contacted the guy about buying it, and he sold it to someone else before Warren got a chance to buy it. This was actually sold back around July 2007. 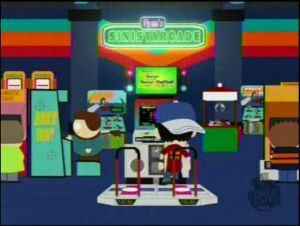 12/17/2007 - Saw that Sinistar was referenced in a South Park episode: You Got F'd in the A**. Episode# 805. They go to an arcade called Flynn's Sinistarcade. Kevin Flynn being Jeff Bridges character in the movie Tron (1982). 10/29/2007 - Got information from the guy in Montreal Canada who I had listed as having a partial Duramold Sinistar. He said it was not a Sinistar, but a Duramold Blaster that was converted to a Sinistar. That reduces the total number of Duramold Sinistars back down to four. See the Duramold page for more details. 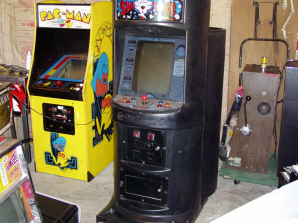 8/24/2007 - My friend, Warren, bought the Duramold Sinistar that was recently found. He gave me some pictures. I need to stop by his house when I get some time to check it out. I started a new job a few weeks ago, and have been very busy. The serial number on his is two digits lower than mine, so it is the second oldest one found. The Duramolds were the last ones off the Sinistar production line. Warren heard that Williams numbered their games sequentially and they all came off the same production line. That meant that a Blaster could be right after a Sinistar, right after a Defender, right after a pinball game and so on. He said that Jess Askey is putting together a database of Williams serial numbers to determine production runs of various games, prototypes, etc. 4/24/2007 - Finally getting around to some updates. I think it is easier to read text in columns that are not so wide, so I formatted this page into a table so I could set the column size. I also decided to spruce it up with some graphics since it was a little boring. The exciting new news is that a third complete Duramold Sinistar has been found (the fourth is missing parts). There is discussion about this one on RGVAC. 12/31/06 - Happy New Year! 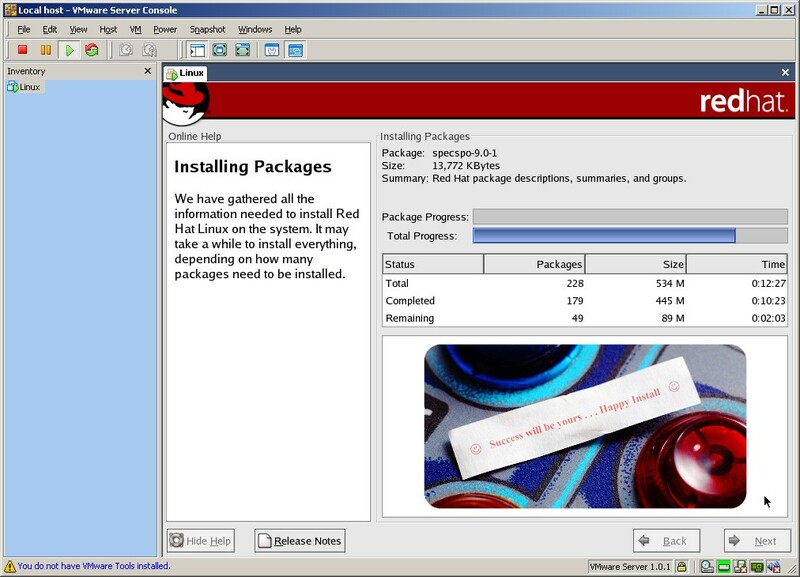 I was just reinstalling Redhat 9 (Shrike) in VMware when I noticed that Sinistar was used for one of the installation photos (screenshot). The fortune cookie fortune is laying on the left side of the control panel of the standard wooden upright. The fortune says, "Success will be yours ... Happy Install"
12/21/06 - In response to my 5/19/04 request, Sam Dicker sent me the link for the Sheena Easton Video - Amost over you (Update: video pulled from YouTube by Viacom) featuring Sinistar and Defender - Two of the games he worked on! At the end of the video she "breaks up" with Defender. 3/1/06 - Redesigned much of the website. I have a bunch of information to add, so it has been a bit slow. I am trying to better organize the information and format it better. 5/19/04 - Came across a Postscript copy of the Sinistar Side Art. Go to this site and do a search for Sinistar. I had to install Ghostscript 8.14 and GSview 4.6 to view the artwork. The rendering is very CPU intensive. 1/9/04 -There was an article in The Onion recently that referenced Sinistar. Pretty funny. 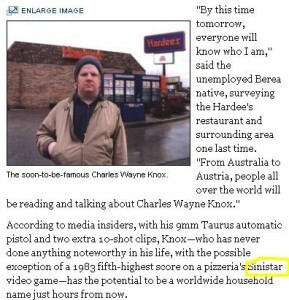 Apparently, people who play Sinistar are destined for a life of crime. Regarding the cocktail Sinistar, I emailed Noah Falstein. He said that he had some written notes about being asked by his managers to make a cocktail version for the "Japanese market only". Sam Dicker said that he didn't have any recollection of programming the screen flipping routine. I have a couple of leads on a cocktail Sinistar if anyone is interested. Lead #1 - One guy in Canada has a cocktail Sinistar that he is willing to sell. It is a conversion, and was not produced by Williams. Email me if you want to get in contact with him. Lead #2 - There is also report of one existing in Sacramento. The guy is a brother of someone who sold a Robotron in the San Francisco Chronical back in 1994 or 1995 in the sporting goods for sale classified section. The asking price for the Robotron was $800obo. If anyone cares to search through microfiche, you may be able to locate the rarest of all Sinistar models. FYI -The SF Chronical has an online search, but it does not include classifieds. Lead #3 - A guy named John Price Harrod IV had a cocktail that looked like it was a Sinistar cocktail, but was converted into a Crazy Kong. I haven't been able to find any contact information on him. John, if you come across my page, please email me. I would like to find out more about this cocktail game. Sinistar appeared in the Sheena Easton video "I'm almost over you". - If anyone has a copy of this video, please let me know. My website sees about 30 to 50 visitors per day. On 1/7/2004, it jumped to 380 visitors, then went back to normal. Very strange. 9/29/2003 - I realized that since my Duramold has the highest serial number I found to date, I may have the revision 4 ROMs that I wrote about on 7/13/03. Upon checking, it turns out that I do have that set. I read them in on my EPROM burner, and compared them to Revision 3. It turns out that they are identical to Revision 3, but they have different label numbers. Many people have Revision 2 ROMS with the Revision 3 updates to ROMS 8 and 11. Williams just renumbered the entire set and made that Revision 3, so there really isn't a Revision 4. I updated my Revisions page to reflect this new info. As far as I know, all Sinistar ROMS are red in color. The only other color was the redish-orange striped ROMS that provided the Revision 3 update to the Revision 2 set. 9/22/2003 - Check out Matt's site at Duramold.com (Link dead see update above). He just purchased an original Sinistar Duramold with a Blaster joystick. This Duramold Sinistar represents one of three known to exist. 7/13/2003 - I talked with the owner of the Revision 4 ROMS. He said that at default settings, the warriors appear more quickly and seem more aggressive than they do with the Revision 3 ROMS. Revision 4 warps straight up. Update: There is no revision 4, the roms are the same as Rev. 3, but they are just renumbered on the labels. I have this set in my Duramold, and dumped the EPROMs to confirm that they have the same checksum. 4/27/2003 - Midway now has the free Macromedia Flash version of Sinistar (Click on PLAY CLASSIC GAMES). Or you can still play it at Shockwave's (DEAD LINK) website. 4/22/2003 - I found out some information about the voice of Sinistar from Sam Dicker. Check out the General Info page. 3/4/2003 - Another revision of Sinistar has been located. It is Revision 4. The ROMS are numbered 16-3004-53 through -63. If you have this revision, please contact me!!! I would like to arrange to have the ROMS read so they can be distributed to the rest of the Sinistar owners. 2/26/2003 - I just became aware of the "ships" version of the control panel overlay (CPO). Most people have the "lines" version, but the prototype version has ships facing out from the joystick. Here is a picture. I heard about several of these. One guy bought a NOS control panel overlay that has the ships and replaced his control panel with that one. Someone else bought their machine with the ships overlay already installed. The "ships" version of the CPO seems to be found on the very early versions of the game. If you have this CPO, please email me.